The Musik Express is a flat ride. It is fast, fun, rerideable, it has a large capacity, and a long duration. Good Musik Express. The ride looks great and I love the music choice by the operators. Also, this one traveled really quickly and had some strong laterals. The cycle really depends on the crowd, as I have gotton cycles that have and havent gone backwards before, but usually its only run forwards. This is a totally avoidable flat ride. The airtime and speed are nothing that you could not get from the rollercoasters, namely Jack, Phantom, and T-Bolt, and the lack of padding in the cars results in pain, whether you are next to the metal wall thingie or not. In addition, the music played is obnoxiously loud, and extremely annoying. 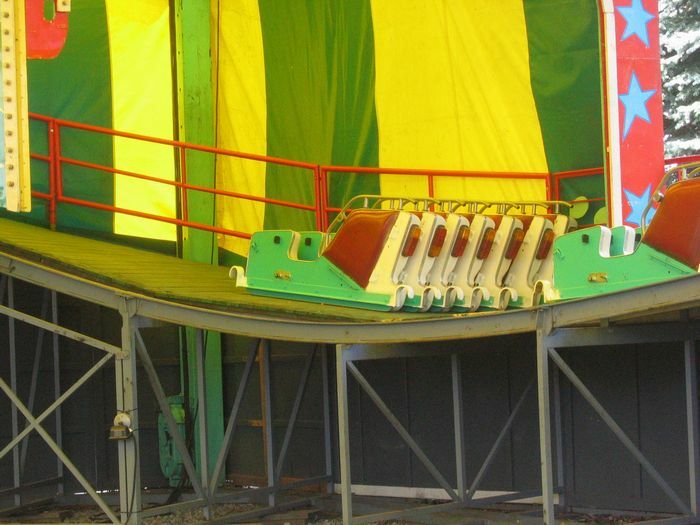 Personally, I am astounded that classic flat rides like Magic Carpet and Bayern Kurve were removed for new rides, while undistinguisible ones like this remain in the park. oh and your not allowed to have four people in a car only 3. trust me i know. I love this ride.This is one of my favorite rides at the park.And it`s fun squishing people. The Musik Express has been one of my very favorites since the first time that I ever rode one. We had one similar to this one in New Orleans at the now defunct Pontchartrain Beach. It had similar artwork (the girls dancing, guys playing the instuments) in fact the two end girls are identical to ones that were on the New Orleans ride. Its centerpiece was a brightly colored crown. 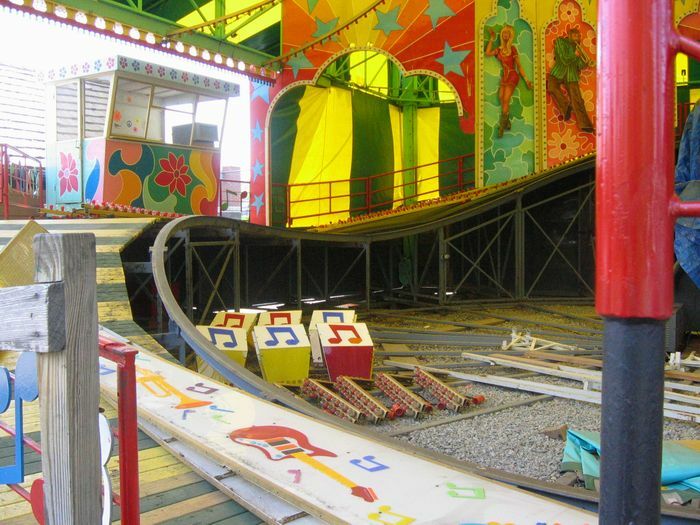 The Musik Express that is in Dixie Landin in Baton Rouge looke identical to the one in Kennywood. I especially love when the attendants allow you to go forwards and backwards. I love many rides but this one will always be my favorite. 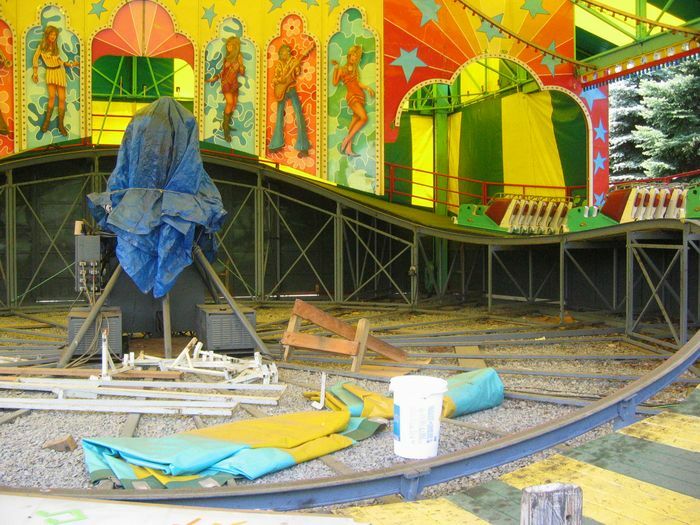 Its nice to see that Kennywood has kept theirs intact with the original artwork, colors, etc. because this ride loses some of its charm when the bright colors and lights are missing.